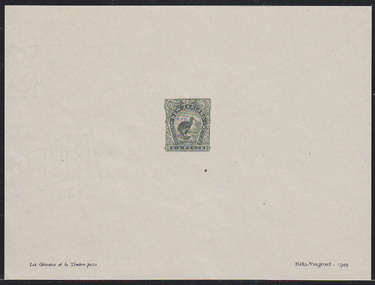 15587 EP NEW ZEALAND (1898) Huia*. Presentation proof printed by Helio-Vaugirard in 1949 to demonstrate their printing techniques. Scott No 75, Yvert No 74. 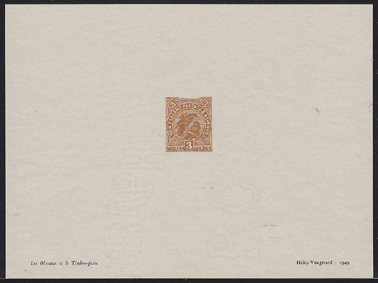 15588 EP NEW ZEALAND (1898) Kiwi*. Presentation proof printed by Helio-Vaugirard in 1949 to demonstrate their printing techniques. Scott No 78, Yvert No 77. Small inclusion in margin. 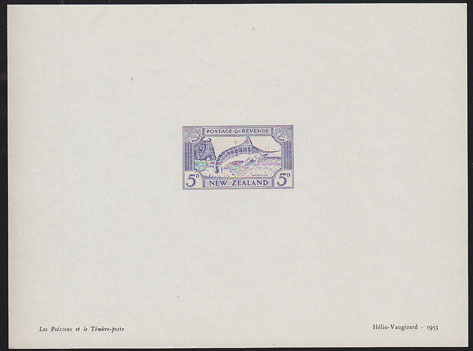 16110 EP NEW ZEALAND (1935) Striped marlin*. Presentation proof printed by Helio-Vaugirard in 1953 to demonstrate their printing techniques. Scott No 172, Yvert No 200. Small inclusion in margin.